I like that, The Paladin is all about the order and is part of a long family line of soldiers and the Fighter is a not so religious type in a long line of Paladins and priests, polar opposites, That should make for a good party dynamic. Trait: If someone is in trouble, I’m always ready to lend help. Bond: I worked the land, I love the land, and I will protect the land. Flaw: The Orcish tribes will stop at nothing to see me killed, and in return i will slaughter them all. Trait: I always want to know how things work and what makes people tick. I'm always picking things up, absently fiddling with them, and sometimes accidentally breaking them. Bond:I work to preserve my university. Ideal: Aspiration. I'm determined to make something of myself. Flaws: I am easily distracted by the promise of information. 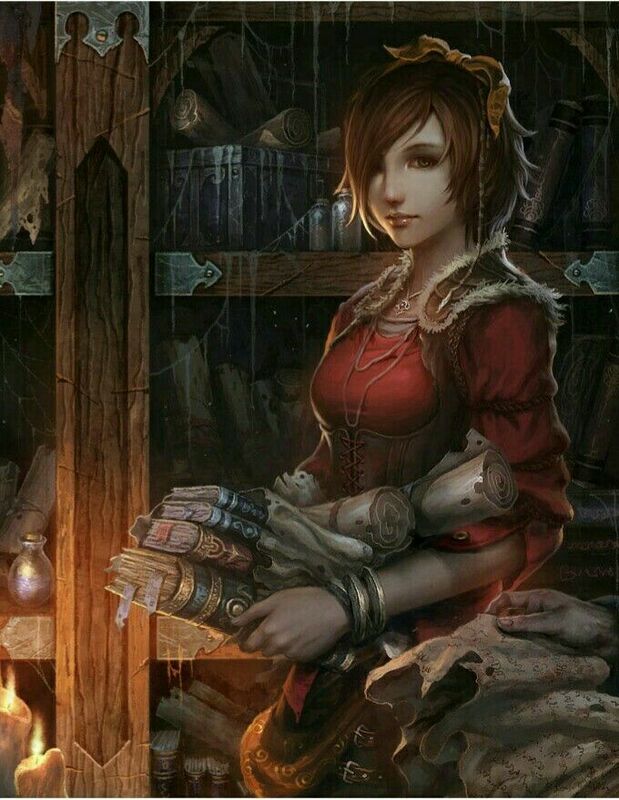 Background: Araceli's father is a successful merchant in the capital, something he is quiet proud of. Her parents were always busy and since she was an only child she spend her time exploring the city on her own or with some children from the neighborhood. In their minds the streets became haunted forests or a desert oasis and they went on countless adventures to uncover ancient secrets. Of course the carnival that came to the city from time to time was always something incredible special. The little girl would spend whole days wandering from tent to tent in awe of the wonders the travelers brought with them. The illusionists were the most faszinating to her since they seemed to let animals and flowers appear out of thin air. Her biggest dream was to gain this power one day and bring all the things she imagened into existence. Years past and while all her friends grew up Araceli would always keep this childish spark which isolated her more and more from her companions. Once her father learned of the vivid imagination of his daughter her got very angrey with her for being so childish. He told her that the steet artists she admired barely show pictures, that none of what they do is real and that she needed to get her head out of the clouds. With only one conversation he crushed the world of the young girl and she spent the following weeks in her room and burrowing herself in books. She read lots stories about strange and wonderful places that were far more exciting than the grey city she called her home and experienced all the things she now knew she would never experience in real life. One rainy day while going through the books of one of the local book stores the pale girl found a book about the arcane that contained information about real magic and the different planes of existance among other things. She spent most of her savings to purchase the little tome which soon became her greatest treasure as it opened a completley new world to her. She devoured the book, read it over and over again until she knew it by heart and practiced the little tricks described in this book eagerly. This was the key for bringing to life her imagination or maybe even visit the exotic places she read about. Of course her magical experiments didn't go by her parents unnoticed. Her father was furious because his daughter wasted her time with this useless tricks instead of learning the family's craft so she could take over the business one day. Her mother on the other hand realized that her little girl had no interest in becoming a merchant. Worried that her daughter's self- study of the arcane would put her in danger someday she used her contacts to reach out to Master Kamex, the only wizard who lived in the city. When Araceli was 15 years old her mother took her to the wizard's tower without her father knowing to ask for advice. The old mage recognized the great potential of the girl so he decided to take her as his personal assistance and student. Since then the young girl has moved to live in the tower to have more time to focus on her studies as well as get out of the way of her father who called her an embarressment to the family and ignored her ever since that day She studies very hard so she could prove herself to her father and make him proud again. Appearence: Araceli is with just 4'9'' pretty short for her age. Her short redish-brown hair often falls over her brown eyes so she trys to hold it back with a bow most of the time. The young woman loves wearing colorful robes and while she doesn't wear a lot of jewellery she always has the necklace her parents gave her when she was very small around her neck. A small owl named Twiggles follows her around wherever she goes. Personality: Araceli is a very friendly and open person who loves learning new things. Always out to find something new she is extremly curious and easily gets exiceted about new findings. Some would call her naive but even though she acknowlages that there are bad things in the world she is alwasy focused on the positive and trys to make the best out of a situation. The young woman is a bookworm who is very studios with a very vivid imagination and wants to use her skills to make people see the world as she sees it, full of wonders. Her biggest dream is to travel the world and someday maybe even visit the feywild, a place she read about in a lot of books in the university's library. The morning sun slowly start to creep through the windows of the small library of the old tower and start lighting up the room. The bookshelves cast their shadows on a short human who sits in one of the armchairs sleeping, an open book still on her lap while a small owl is perched on the back and eyes her curiously. One ray of sunlight finally tickels her nose and with a small sneeze the young woman wakes up and rubs her eyes sleepily. "Good morning Twiggels", Araceli mumbels as she streches careful to not make the book slide of her lap. She looks around a little bit disoriented. " I must have fallen asleep again. Well, I should probably not sneak out to read after lights-out again..." Suddenly she jumps up as she realizes how late it must be. "I overslept again!" she curses while hurrying out of the room trying to straighten her red robe and hair. A little bit out of breath she finally arrives at Master Kamaex's office and she takes a deep breath before gingerly knocking on the door. "Come in" a raspy voice responds and Araceli opens the door just enough to slip inside carefully closing the door behind her. "Good morning Miss Hazesun" the old man wearing a simple dark robe eyes the young woman and his deep blue eyes spot the crumpled dress and bow. "I take it you slept well then" he says calmly and his student turns to the side. " Yes thank you... I mean... I'm very sorry Master Kamaex. I won't happen again" the young woman answers contritely while studying her shoes. The stern expression of the elderly wizard soften when suddenly the unconfortable silence gets interrupted by the sound of a growling stomach. "Well, I have already started the process so you won't be of help for me for another hour. I think you will be able to make good use of this time." he nods toward her with a slight smirk. "And after you come back you will clean up the lab, it seems like it's been a while since it got a proper cleaning" Araceli's face that just lightened up at the thought of breakfast falls ever so slightly. "Of course, Master" she bows a little and with a returning smile and a "Thank you Master" she leaves for the kitchen. Araceli pulls her cloak a bit tighter around herself and as she approaches the temple of Evelyn. This is the fourth time this week Master Kamaex send her to get another vial of holy water. Lost in thought she scratches Twiggles who sits on her shoulder. "Something is wrong, Twiggles" she whispers to her familar as she reaches the steps leading towards the entrance of the temple. "He has always told me what he's working on but now... he just aviods all of my questions. I see him suffer but he just won't accept any help" She sighs quietly as she knocks on the big wooden doors. "Something is very wrong" she repeats in her mind as the doors open. " And I will find out what it is"
Last edited by cookieyummy; 01-26-2018 at 01:23 PM. "Ooooooo, cookie. I must have a cookie- yum." I'm intrigued by this homebrew and the plot hooks too! Will be cooking up a ranger, I think, later today and tomorrow. Cheers! Looking forward to what everyone puts together! Trait:I want understanding and harmony between all, even if I lack that understanding myself. Flaw: Violence means the battle’s already been lost. Appearance: Jubai dons a cloak of plain, homespun wool dyed as green as a fresh shoot of grass and as brown as the sturdiest maple. 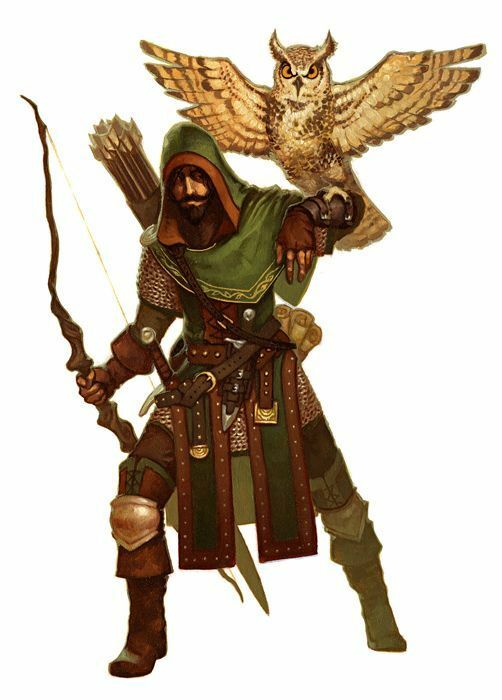 Always with his Great Horned Owl, Gryff, the young half-elf wears a variety of gear to suit his tracking and scouting through the great woods of the North. With a brown, drooping mustache and a thick brown beard framing his oft-smiling face, Jubai seems very much a human. Upon further inspection, however, or perhaps a cast to the ranger’s emerald eyes, his true half-elven heritage is revealed. Personality: Jubai, the half-elven ranger has the skills of a scout and a hunter, but the heart and soul of a diplomat. Always with a twinkle in his deep, green eyes, and an almost fey sense of curiosity, Jubai picks his way through life brashly but with the consideration and regard of a trained woodsman. Through his upbringing and his work along the border with the Areth Taesi, Jubai learned the value and appreciation of his dual heritage as a half-elf and was encouraged to embrace elven values by his adoptive father, Delwin Dacus, who, though human, understood the innate connection of the elves to Nature. Reflecting those lessons and experiences, Jubai strikes others as young but also deeply interested in learning about others. Influenced by a childhood spent among the more wild varieties of fauna, the ranger’s aptitude for harmony and symbiosis holds a great sway over his actions. But just like the denizens of the great woods and the Areth Taesi themselves, when angered or his kin endangered, Jubai brings passion and justice in equal, efficient measure regardless of the pain it causes him. Raised by an adoptive human father and trained as a warden for the Kingdom of Rhyfel, Jubai grew into the man he became from the woods. He studied the ways of the trees and the creatures that lived and thrived in the pine forests, following his father’s teachings of respect and consideration for all forms of life. Finding Gryff, his brown and white plumed owl as a hatchling, the two developed an almost silent means of communicating and share a mutual satisfaction in their respect for Nature and their ability to aid one another. Only in his fifth year of life, when met with a patrol of human soldiers inspecting the border with the elves of the Areth Taesi did Jubai realize just how different he lived than the humans of Rhyfel and learned the truth of his own heritage. His father, as human as the soldiers they patrolled with, lived like an elf, the young half-elf realized. But more than that, he didn’t fear the elves as the humans did. Because of that, Jubai and Delwin cooperated and found chances to work with the Areth Taesi far more than the human commanders would allow, had they known. Unbeknownst to the leaders in Kersdinas, the border, in some locations, was maintained through a loose understanding with the elves of the Areth Taesi. Though Jubai and his father suffered their fair share of bloodshed with the old kin, some unwilling to trust humans after their brazen transgressions, often, the rangers of the great northern woods found relationships more effective than arrows. Medicine secretly delivered at dusk to a sick elven elder, a stream purified for ranger-use, snatches of elvish and common in the hush of night. These were the victories Jubai craved: the moments when mutual growth overvalued destruction. Armed with his bow, his partner in all things, Gryff, and the lessons of the woods, Jubai left the North for the first time since his birth towards Coedtref. Delwin traveled alongside the ranger but kept his mind closed, occupied with the journey before them for reasons unknown. In his quiver, the ranger carried arrows. In his mind; words. Jubai lay completely silent against the smooth, mossy surface of the branch. Gryff poked the back of his hood annoyedly and the ranger’s hand shot up, gesturing for calm. My god, that bird has the blood of an orc! the ranger thought with a grin. His quarry moved once more, rooting through the grass and dirt of the forest floor, searching for tubers. Thick, yellowed tusks jutted from the creatures mouth and its movements belied a strength and sturdiness that still left the ranger in wonder. “Razormaw” they’d named it. He wasn’t quite sure what the elves called it but he could imagine; they tended to be more colorful in their characterization of those they hated. Nor could Jubai blame them; the boar had been terrorizing the slopes near the Everbrook where many elves regularly congregated for ritual and for sustenance alike. Of course, none had ever seen Jubai or his father; the place would have been long since abandoned. Delwin had warned him to never set foot in the area, “they’d know” he had said with that mystical surety he always seemed to possess. Finally, Razormaw had begun corralling his kin into the clearing, filling the air with the sounds of churned dirt and what sounded like relieved grunting. He had been driving the herd hard these few weeks. Maybe they’d be better off… thought the ranger as he drew his arrow to his cheek, letting the fletching brush his cheek. He always fletched the first arrow of a hunt with a feather of Gryff’s. Of course, the ornery bird didn’t EMBRACE the tradition but he acknowledged the symbolism as he always did with his wide, amber eyes. If the two were driven to kill, let it be known who rose their hand and struck. It was never a decision made lightly. The first arrow met its mark and Razormaw flew into a rage. Spinning, quickly locating the tree from which Jubai loosed and drew arrows at a frightening speed, the boar rammed the tree. The sound of tearing roots reverberated up the tree and Gryff descended with a screech, fanning his wings in the light, pronouncing his majestic size and capability. His talons found purchase and he dove away, rounding for another approach as the tree completely gave way beneath the boar’s assault. Drawing his knife, Jubai gave a silent prayer as he embraced his fall, boots towards the rapidly approaching ground. At the last moment, he twisted, whipping his body until it fell above the hog and blunted his landing. Rolling off, panting from pain shooting up his side, the half-elf wrenched his blade free from the now-dead hog’s skull. Kneeling then, he cleaned his blade and regarded the corpse before him. A King it had been. Hulking, scarred and gnarled by a life of leading. He felt a loss in himself as he watched as the remaining boars burst for the tree line and lose themselves into the deeper woods. Gryff’s gentle hoot alerted him to the elf’s presence who stood above the two on a vine-enshrouded ledge. Gods above, he hadn’t even seen them. thought Jubai. “I leave him here for you, older kin, that you might bathe and pray in peace.” The elf’s eyes narrowed at mention of the Everbrook, surprised at the ranger’s knowledge and she hissed. Then, she softened and Jubai found himself marveling at the agelessness of the face that looked down upon him. Maybe it was what she saw in those eyes that stopped her, maybe it was the way he had mourned the beast. He wasn’t sure. But he left shortly after, Gryff perched on his shoulder, preening. He had promised himself he’d protect the brook. He had seen how much it meant to those people, though he himself had never enjoyed its waters. Which was why his step had a spring to it, a cadence of contentment almost, as he made his way down the Goldcrest Run. The water in his flagon had a sweetness, a purity to it the likes of which he’d never tasted. It had been waiting for him when he woke, tied to an arrow on the outskirts of his makeshift camp. Unadorned, simple, it had waited for him and he drank deeply of it now with a smile. Jubai fed another branch from the dead tree into the fire, fending off the encroaching chill falling across the moonlit ruins. Ruins, it seemed, from long ago that had been built upon time and time again. The foundation seemed squat, like a burrow almost, with its outer stones set into the ground, scooping the earth and forming a dirt floor. It was certainly different than the human settlements and buildings he’d seen in his rare travels South. He wondered, with a glimmer of fear, if this was a remnant of when the orcs ruled across Rhyfel, or whatever they’d called it. Why had Delwin brought him away from the forest down into these unknown lands? His sense of purpose had scared the half-elf at first, rarely had his old man spoken with that sternness in his voice, even in battle. Even now, the old man had melted into the woods, mumbling something about firewood. Why had he brought Jubai away from his home, from the woods that he had once trained the young half-elf to embrace? Was… was it orcs? The elves had seemed docile along his stretch of the woods, maybe he was being sent to another border where his skills might find greater need. He just didn’t know. Idly he wondered about orcs. Wondered about how they saw the world. Was it all bloodshed and loot? Or was it something more? Just from his chance interactions with the soldiers who had inspected the woods, the ones he had guided, he knew the rulers of Kersdinas spread malice about the other races like breathing. Having heard the soldiers speak of the elves as “bloodthirsty” had confused the young ranger to such a degree that he found he studied the human soldiers more than the elven renegades they sought. Renegades, who at the end of the day, saw themselves as patriots. Did the orcs see themselves the same? Of course he knew the story of Evelyn and the faith her act had founded. Of course he had heard the atrocities of the orcs and the hatred the common people held for them. But… thought the ranger, glancing upwards as the stars lit the dark blanket of night, what of the orcs themselves? He wondered where he was going, but he was sure it would be far from home. Delwin would tell him when the time was right. There was a reason the old man had been tight-lipped but just like before, Jubai had learned to trust his father's instinct just as much as the bow beside him. Feeding Gryff a strip of jerky from his pouch, the ranger sat still with his thoughts. The owl cooed gently in the ranger’s ear, accepting the food. Perhaps Gryff felt the same. It was hard to say. But either way, the two listened to the pop of the wood on the fire, seeing its embers drift and disappear against the night and shared the soft, companionable silence that followed. My app is now complete - at least as much as can be done on my own. I'm planning on giving feedback on all completed apps at the end of January. For the human characters, can we use variant human? A question just belatedly occurred to me: Will the Paladin and Priestess already know one another? I have no idea how much (if any) the Paladins mingle with their charges.